Whether you are looking to grab a quick drink with coworkers or want to create a memorable experience with friends and family, Concetta’s Italian Restaurant should be your restaurant of choice. Our menu is endless with options that include steak, seafood, and pasta specialties. 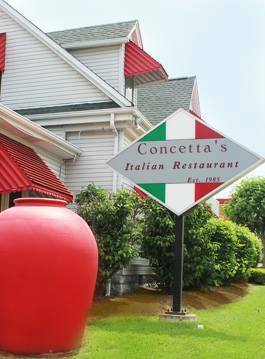 The atmosphere and food at Concetta’s Italian Restaurant is like no other. The next time you are in the area be sure to bring your family and friends to our restaurant for fine Italian cuisine at its best. *If you are ordering through our online ordering service you must have more than 12 hours before your delivery or pick up time. If you have a catering request that is less than 12 hours from delivery or pick up please call the restaurant.